Hail causes millions of dollars in damage each year in Colorado. 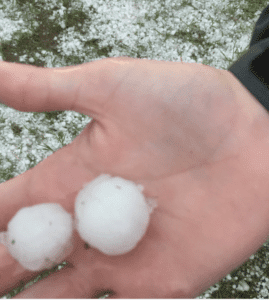 Denver roofing companies have been extremely busy the past couple years with multiple hail storms causing billions of dollars in property damage. From the Denver Metro area and all along the front range from Colorado Springs to Cheyenne, insurance companies have been hit hard with claim losses as a result. Thousands of damaged Colorado homes and buildings have already had their roofs replaced. However, thousands of roofs, with real damage, remain untouched and vulnerable to leakage – a problem unknown to the home or building owner. New Roof Plus is highly experienced helping owners to identify damage. The challenge for an owner is that from the ground it is usually very hard to tell if damage has been done. It’s also a dangerous job for a homeowner or building manager to get up on the roof and check for themselves. We don’t recommend it as it can be slippery and unpredictable. Plus – most people aren’t sure what they are looking for. Damage can show itself in several obvious ways but often times it takes a seasoned pro to spot it. Damage can, at times, be hard to recognize. Many hail marks on the roof of this Denver area home. Some easy tell tale signs are large amounts of roofing granules in your gutters and gutter wash out areas after a storm. This indicates the roof’s protective layer of granules was hit by hail and it removed these granules from it’s foundation, leaving your roof exposed. 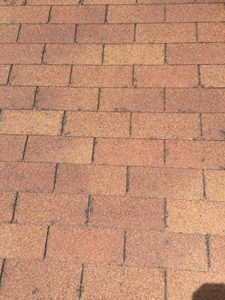 A composite roof without protective granules is no longer a working roof system so it needs replacement and insurance companies recognize this. 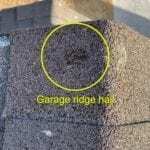 Another indication of damage, when looking from the ground, is darker spots on the roof. These indicate impact damage from hail stones. If you can see these, you likely have substantial damage. Another obvious note is that if your neighbor had their roof replaced, it’s worth having your roof inspected also. Our inspections are free. And an estimate is of replacement cost is also free. We work with home owners and building owners to help them understand the heath and condition of their roof or roof system. Some people are hesitant to contact their Insurance agent to ask for an inspection. They worry that their policy might be negatively impacted. But this is not the case. Insurance companies expect that their customers, you, will want to know if their property is in good condition. This is why we all buy insurance after all. Since we do this all the time and have years of experience, we know when a roof should be replaced. We understand what an insurance company needs to see to replace a roof. We try to help both the owner and the insurance company determine that proper course of action. As we state often, our job starts with being honest to all parties and making sure the property is properly protected and safe. If a roof needs replacing we know it and we will fight if need be to prove it. If a roof is not damaged, we will not lie to anyone about it – even if a customer presses us to do so. It’s not in our make up to do business that way. Unfortunately, their are many roofing companies willing to do just that. You can usually spot them a mile away too so be careful who you choose. We will inspect your roof at no cost. We will give you a report on what we found, the condition of your roof and if appropriate, and an estimate for repairs or replacement.